Welcome to the 2016 Home Buying Guide. This 100-page e-book was created for U.S. home buyers who are planning to buy a house in 2016. It is geared for first-time buyers in particular, but even "veteran" homeowners will find it useful. You can also print the book and share it with others. If you've been watching the news, you'll know that our housing market has changed dramatically over the last decade. We've experienced a housing bubble, a housing crash, and a full-scale economic recession. But now here we are approaching 2016, and the housing market appears to be on solid footing again. Still, a lot has changed. New government rules were enacted to curtail "risky" mortgage lending. Certain types of home loans have fallen out of use. Home prices have fluctuated wildly. As a result of these and other changes, buyers need to be well educated about the mortgage and home buying process. And that's where this book comes in. This book will help you choose the best type of mortgage loan to suit your needs. You'll learn how to evaluate the seller's asking price and make a smart offer. You'll learn how to prepare for the closing / settlement process ... and much more. If this is your first time buying a home, you might not even know where to begin. Don't worry. That's only natural. Every first-time buyer feels hopelessly confused in the beginning. Here again, the 2016 Home Buying Guide comes to the rescue. This book divides the process into 11 steps, making it much easier for you to understand. Each step is explained thoroughly, and in plain English. Start saving money for your home-buying expenses. Decide which type of home loan works best for you. Start shopping for a house. Make an offer to buy a house / negotiate with the seller. 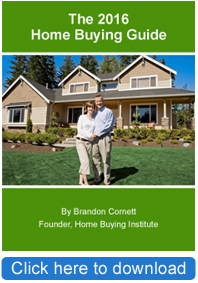 The 2016 Home Buying Guide was written by Brandon Cornett. Brandon is a full-time real estate researcher and writer. His work has been cited by the San Francisco Chronicle, Forbes, Bloomberg, Time magazine, PBS and more. He is the creator of the Home Buying Institute and the curator/editor of HousingBrief.com. Brandon has been writing about real estate topics for over a decade. You may share the 2016 Home Buying Guide with your blog or website visitors. We simply ask that you include a citation link back to this website, HomeBuyingInstitute.com. We also ask that you refrain from editing or modifying the book. You may download our handbook for your own individual use. You may share the book with your blog or website visitors, if you include a citation link. We recommend linking directly to this page, to give your readers access to the latest version. You may not modify or edit the book in any way, or claim ownership / authorship. The author of this book retains all copyrights. The best way to share this book is to link directly to this page. There's a practical reason for this. We update the 2016 Home Buying Guide periodically to keep up with changing market conditions, mortgage trends, etc. If you send your website visitors or blog readers to this website, they'll always have access to latest version of the guide. On the other hand, if you download a "static" copy of the book and offer it through your website, it will eventually become outdated and less useful. If you have questions about the 2016 Home Buying Guide, please send an email to editor@homebuyinginstitute.com. © 2015, Home Buying Institute. All rights reserved.